My baby cousin, India, is having a baby next month. She’s 22, so I can’t really call her my baby cousin anymore. But I remember that she was the first baby I ever held, when I was 7-going-on-8. So I wanted to make her a fun blanket for the baby boy she’s expecting. Her shower isn’t until the end of February, but this is already made and ready to go. It’s just like Alannah’s Blanket, Yvonne’s Blanket, and the Little Red Riding Hood Blanket, but I’ve been playing with the original quilt design from Last-Minute Patchwork + Quilted Gifts. I tried to follow the lines of the car fabric with this one, and the next one I make I’ll play with different quilting altogether. The blanket itself is a really basic idea, so I’ll try playing with pattern and stitching to make them fun. India registered for some cool baby boy goodies, including a brown chenille blanket with white polka dots. 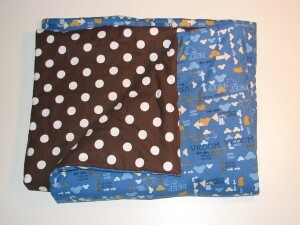 I had that exact fabric in my stash already (from JoAnn), so I put it on the back of this great “Beep! 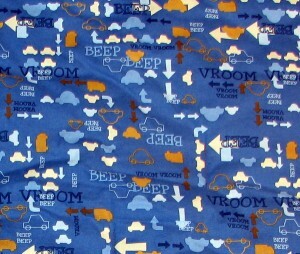 Beep!” fabric from Hoffman. I am obsessed with that car fabric, I bought the blue and brown colorways last summer and have been waiting for the perfect project to cut into it.